Like me, you have most likely been receiving a constant barrage of emails from companies who want to confirm that you still wish to receive marketing communication. Working within the marketing industry, I was keen to see how companies used this opportunity to keep their consumers engaged. Having to ensure your database is GDPR compliant has been a pain in the neck for millions of businesses, but why has it not been seen as a positive exercise? You are gaining a list of people who actually care about your business. With some tools charging based on how many subscribers you email, you could actually end up saving money! 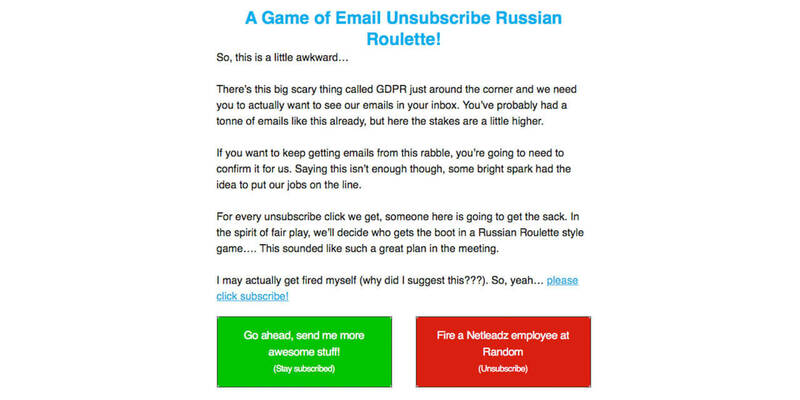 With the deadline rapidly approaching, and the so-called “GDPR SWAT Team” camping outside your premises, I thought I would share the good, bad and ugly opt-in emails that we have seen so far. Avoiding the regular boring newsletter, Netleadz attempted to add some humour with a sprinkle of fear into their opt-in campaign. We had mixed feelings about this in the office; some found it funny, while others thought that it was going too far. Let’s hope nobody calls the GDPR police! We have a seen a mountain of offers promoted to entice subscribers to stay opted in. With competitions running alongside opt-in campaigns, it can be seen as confusing. Is the person confirming they want to hear from you or just trying to win the competition? 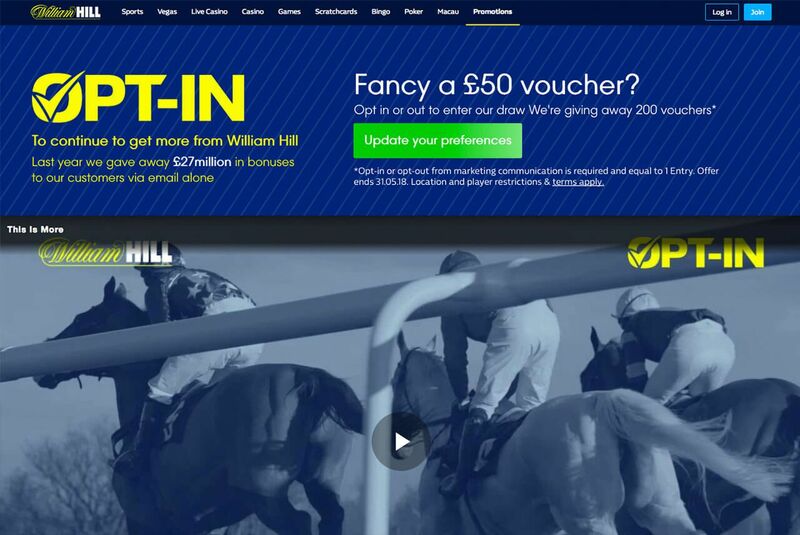 William Hill was one of few that actually decided to reward people even if they opted out. This was a breath of fresh air, and even though it is still incentivising the campaign, it isn’t penalising those who opt out. Instead of running a solus opt-in campaign, Selfridges & Co decided to incorporate this into every newsletter. Since January, every piece of email communication has reminded subscribers that GDPR is coming and they will need to update their preferences. This a great way to remind people of the impending deadline and not leave such a crucial task to the last minute. 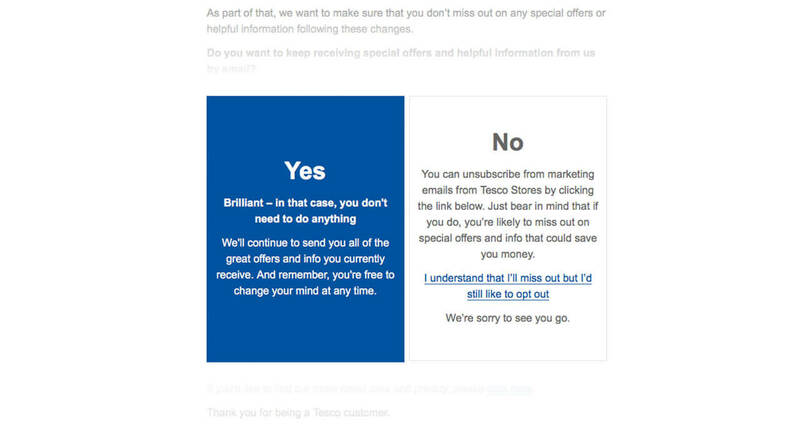 Over the weekend, Tesco’s opt-in email kept coming up in conversation and not for good reasons. I say opt-in very loosely due to the fact they went down the road of getting people to opt-out. I have seen multiple companies choose this tactic, fighting to save their database. The most annoying part of this is that hundreds of people won’t even bother opening the email – does this mean they are happy to still receive communication? I think not! The clue is in the name ‘opt-IN’. If you can’t be bothered with running an opt-in campaign, you can always follow the steps of JD Wetherspoons and scrap sending marketing via emails. Back in June 2017, an email sent from Chief Executive John Hutson explained: “Many companies use email to promote themselves, but we don’t want to take this approach – which many consider intrusive.” He went on to confirm “Our database of customers’ email addresses will be deleted”. Wetherspoons would now focus on promoting deals using their website and social channels. With the deadline approaching this Friday, It has been an interesting few weeks seeing how creative businesses can be with ensuring that their consumers continue to engage with them. We have been helping a number of clients run opt-in campaigns and have seen a positive response. Here at Brave, we’ve helped businesses with marketing strategies since 2000. If you are looking to reach your audience in a new way then get in touch and see how we can help grow your audience. PLEASE NOTE: The views and opinions shared in this article are my own and do not represent the views of Brave Agency.